cerise-satchels-handbags – Satchels have a long history, starting with Roman Legionaries who used satchels for rations and personal belongings. The satchel was originally called a ‘loculus’, which meant ‘little place’ in Latin. 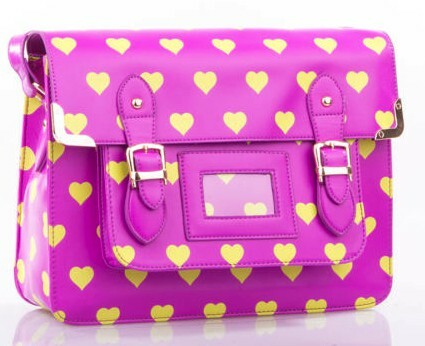 Today, satchels are also known as book bags, school bags, messenger bags, and trolley bags, and are widely available in traditional stores as well as online venues like www.edsfashions.co.uk. Satchels should not be confused with totes, as they are made from different materials, have different straps or handles, and are better made for wearing over the shoulder. Satchels are usually made from soft leather, canvas or nylon and are available in a variety of colours. Leather satchels are a bit more expensive, but vinyl bags can crack and split when continually exposed to weather and frequent use. Before buying a satchel, consider what material it is made from. These materials range from natural leather to synthetic materials. Leather is waterproof and is a luxurious option for a satchel. Leather satchels are widely available because leather is very durable, pliable, and easy to care for. Leather satchels come in many colours, making them easy to pair with a wide range of outfits. For example, a purple leather satchel can be carried with an outfit that consists of purple tights, and boots. Canvas is a widely popular textile for school satchels and is much cheaper than other types of materials. The soft flexibility of canvas provides ample room to store books and personal belongings, and canvas is highly durable compared to some other materials. One of the downsides to canvas satchels is that they will require frequent washing and this causes colours to fade. Canvas satchels are popular amongst older students who are looking for a satchel with plenty of room as well as distinctive style. When buying a satchel, choose a stylish and fashionable backpack or trendy messenger bag in colours from sea green to olive brown. And for a really stylish look, pair the satchel with a sleeveless cardigan in the latest fashion.